As in the previous year, there were three Touring groups; however, there were some significant changes. With dwindling entries in Touring Car B class series management decided it would not be included in the 2018 championship and was replaced by a new category, TCR. 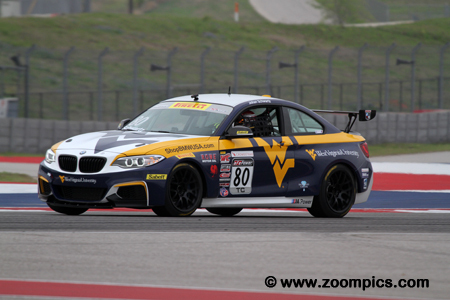 The opening rounds of the Pirelli World Challenge Touring Car season took place during the Grand Prix of Texas weekend. Seventeen Touring Car drivers competed in the two forty-minute races around the Circuit of the Americas’ twenty-turn 3.4-mile road course. The start of race one for the 2018 Pirelli World Challenge Touring Car championship. 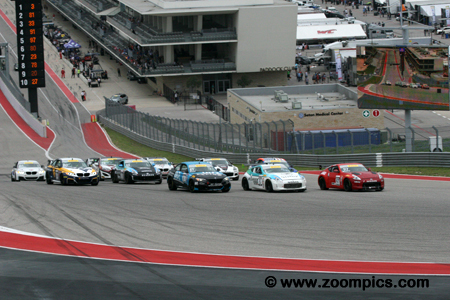 Seventeen cars head up the hill and into corner one at Circuit of the Americas. 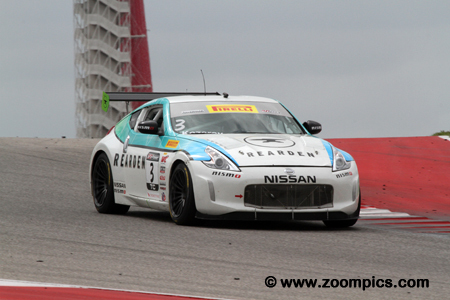 Leading the way is the pole-sitter, Vesko Kozarov in the Rearden Racing Nissan 370Z. 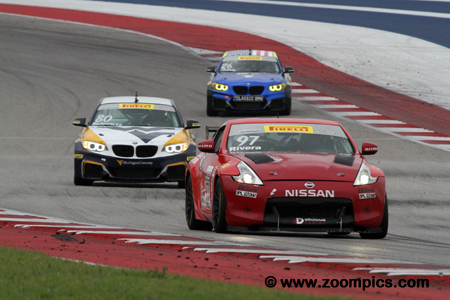 Charging from fifth on the grid to second place is the orange Nissan 370Z of Tony Rivera. Vesko Kozarov driving the No. 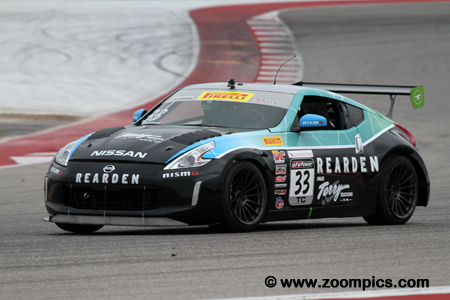 3 Rearden Racing prepared Nissan 370Z TC Spec opened the season with a dominant performance. Kozarov was quickest in the opening practice session and qualified on the pole for race one. He led flag-to-flag – capturing the opening round of the Touring Car season. It was much of the same on Sunday as Kozarov won by a margin of 2.885-seconds and took a comfortable lead in the title chase. In 2018, Karl Wittmer exchanged the family’s well used Honda Accord (the Honda had been campaigned extensively by his brother, Nick) for a new BMW M235iR Cup. Wittmer qualified fourth in the first contest and grabbed the final spot on the podium. In round two, contact with Jacob Ruud on the second lap in turn twelve damaged his BMW but he was able to continue and earn a fifth-place finish. The No. 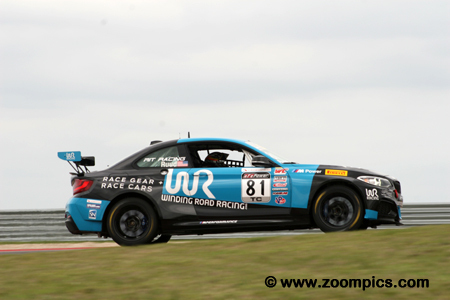 81 Winding Road Team TFB BMW M235iR was driven by Jacob Ruud. Ruud qualified on the outside of the front row for Saturday’s event but dropped to third at the start. Contact with Tony Rivera caused him to spin and finish eleventh. The following day an aggressive move on Karl Wittmer in turn twelve caused damage to the right front on Ruud’s BMW. He retired on lap-2 and was not classified as a finisher. The only driver that appeared to be a threat to Vesko Kozarov was his Rearden Racing teammate, Paul Terry. Terry topped the timesheets in the second practice session and qualified his Nissan 370Z TC Spec third quickest. In race one, he chased Kozarov and finished 1.634-seconds behind him in second place. On Sunday, Terry was gridded third but he retired before completing the first lap. 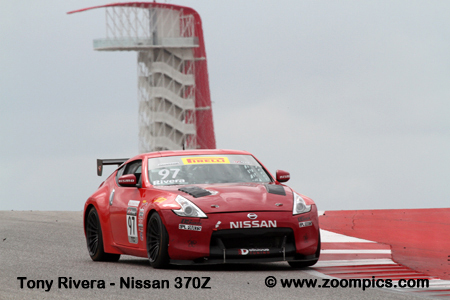 Touring Car veteran, Tony Rivera qualified his Nissan 370Z TC Spec fifth quickest for race one. An excellent start by Rivera allowed him to slot into second behind the pole-sitter, Vesko Kozarov. He lost several positions after contact with Jacob Ruud but regrouped and finished fifth. In round two, Rivera fared much better – starting on the outside front row, he chased the eventual winner Kozarov and took the runner-up spot. 2015 TCB Drivers’ champion, Johan Schwartz drove the No. 80 Rooster Hall Racing BMW M235iR Cup. 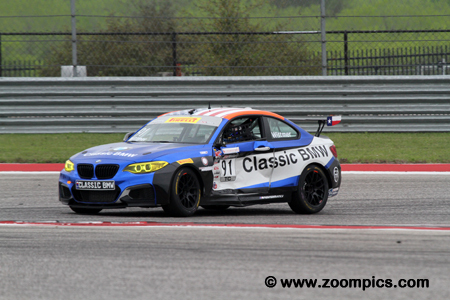 Schwartz qualified sixth for the weekend’s opening round and challenged third-place finisher, Karl Wittmer most of the race – missing out on the position by just 0.298-seconds. The following day, Schwartz started fourth. He gained a spot when Paul Terry retired and maintained third to the checkered flag. The Touring Car podium for round two at Circuit of the Americas. In the center and taking his second consecutive victory of the weekend is the driver of the Rearden Racing Nissan 370Z TC Spec, Vesko Kozarov. 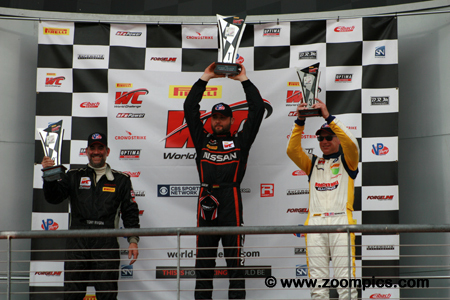 To Kozarov’s left is the runner-up and Pirelli World Challenge veteran, Tony Rivera. Completing the rostrum is former TCB Drivers’ champion, Johan Schwartz.